With this week’s issue of the WJ spotlighting the river city of St. Louis, the Old Boat Column focuses on a steamboat that played a prominent role at the St. Louis waterfront for many years. Built in 1907 at Grafton, Ill., the sidewheeler had a steel hull that measured 188.5 in length by 32.2 feet in width. Four boilers supplied steam to engines having 20-inch cylinders with a 6-foot stroke. Constructed at a cost of $65,000, the boat was named Erastus Wells to honor a prominent citizen. Born in 1823 at Sacketts Harbor, N.Y., Wells moved to St. Louis in 1842 and established the first streetcar company. He also was an esteemed member of the St. Louis Board of Aldermen and served as president of the Missouri Railroad Company from 1859 until 1883. Wells was elected on the Democrat ticket to the United States House of Representatives in 1868; he unsuccessfully ran for re-election in 1876, but ran again in 1878, winning back the office and serving until 1883. After leaving office, Wells became president of the Laclede Gas Company. The father of St. Louis mayor Rolla Wells (1856–1944), Erastus Wells died at age 69 in 1893 and is interred in Bellefontaine Cemetery. The steamboat Erastus Wells faithfully flushed the mud off the cobblestone levee after each rise, utilizing the powerful pumps and hoses with which it was equipped for duty as a fire boat. 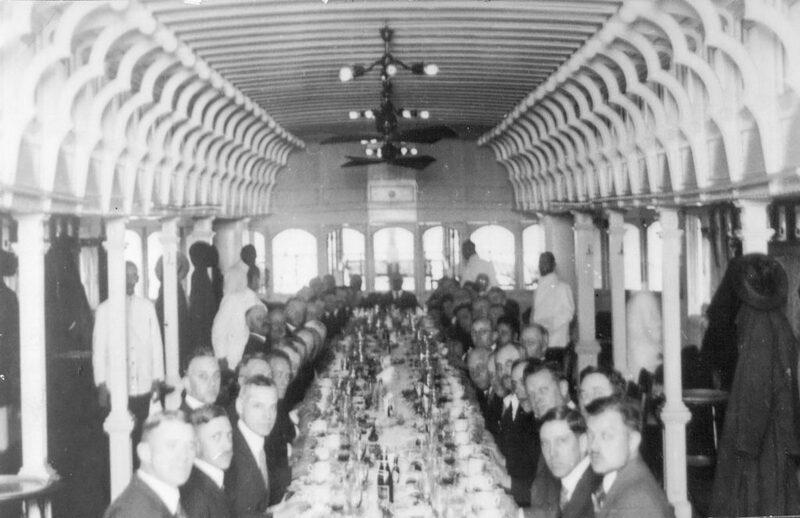 The riverboat had extremely fine hull lines and was exceedingly fast, often being used to take visiting dignitaries on tours of the St. Louis harbor. The vessel was nicknamed “The Greyhound of the Mississippi,” with racing greyhounds painted below the pilothouse nameboards. As an elegant new steamboat, it participated in the 1907 steamboat parade down the Mississippi for President Theodore Roosevelt, and again in 1909 for President Taft. During the years of the Great Depression, the city administration was unable to allocate the $51,000 annual budget required to operate the steamboat, and it was offered for sale at a public auction. Bids were received from the Evansville & Bowling Green Packet Company ($5,100), the Stiers Brothers Construction Company ($1,000) and from Commodore Edwin C. Koenig, who placed the highest bid at $6,100. 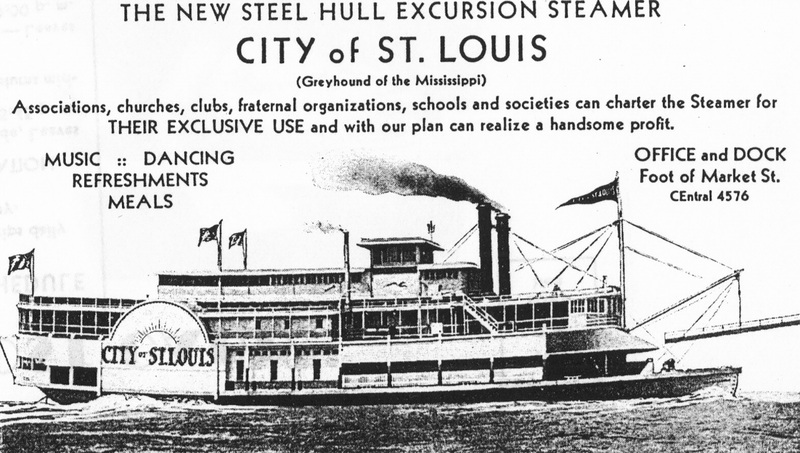 Koenig remodeled the vessel into an excursion steamer and renamed it City of St. Louis, running it in keen competition with the Streckfus Line. The popular riverboat operated for only two seasons under the command of Capt. C.H. “Corn Cracker” Smith, and managed by Andrew Franz, who served as advertising manager for The Waterways Journal. The handsome steamboat made its final trip on Labor Day of 1934, with a round trip between St. Louis and Ste. Genevieve. Sold in 1942 to the Bolz Dredging Company, the boat again changed owners in early 1944 when it was purchased by the Allied Oil Company; it was ultimately dismantled and the sturdy hull used for a landing barge near Thebes, Ill. Numerous artifacts from the sidewheeler, including the roof bell, pilotwheel, steering levers, cabin carlings, running lights and other relics survive today in museums and private collections.